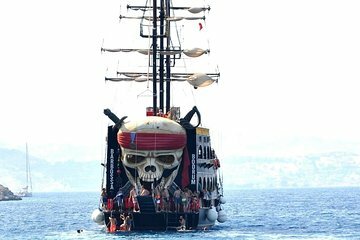 Discover sights along the Turkish coast on a full-day pirate boat tour from Kemer. Visit scenic Cleopatra Beach and Caretta Bay, go swimming in the turquoise Mediterranean Sea, and enjoy the provided lunch served on board. You also have the option to take in the ancient Greek and Roman ruins at Phaselis (own expense). Hotel pickup and drop-off is included for your convenience.